Practices are Fridays from 6:00 –7:00 p.m. The Demo Team encourages the students to excel in their learning capacity mentally and physically. 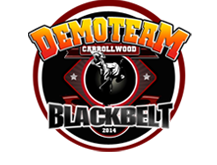 Tryouts for the Demo Team are held three times a year. Most of the students maintain an A and B average grade in their schools and have excellent conduct at home and outside our school. After joining the team, the students train in musical & weapons forms, as well as choreographed fighting scenes. They perform throughout out the year at different shows like schools festivals, carnivals, and parades and also have the opportunity to appear in different TV martial arts shows.